"Verandah" redirects here. For the vine training system, see Verandah (vine system). A veranda or verandah is a roofed, open-air gallery or porch, attached to the outside of a building. A veranda is often partly enclosed by a railing and frequently extends across the front and sides of the structure. Although the form verandah is correct and very common, some authorities prefer the version without an "h" (the Concise Oxford English Dictionary gives the "h" version as a variant and The Guardian Style Guide says "veranda not verandah"). 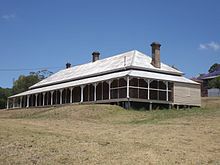 The veranda has featured quite prominently in Australian vernacular architecture and first became widespread in colonial buildings during the 1850s. The Victorian Filigree architecture style is used by residential (particularly terraced houses in Australia and New Zealand) and commercial buildings (particularly hotels) across Australia and features decorative screens of wrought iron, cast iron "lace" or wood fretwork. The Queenslander is a style of residential construction in Queensland, Australia, which is adapted to subtropical climates and characterized by its large verandas. The bandeirista style house from Brazil typically has a veranda positioned to face the sunrise. In Heavy Snowfall region in Japan , especially Aomori and Niigata Prefectures, The structures are developed called Gangi-Zukuri (ja:雁木造) since Edo period. For example, The total length of Gangi in old Takada city is over 16 Kilometers. In Poland, the word "weranda" is commonly used for the unheated roofed annex to a house, without walls or with glass walls. The Creole townhouse in New Orleans, Louisiana, is also noted for its prominent use of verandas. In fact, most houses constructed in the Southern United States before the advent of air conditioning were built with a covered front porch or veranda. Spanish Colonial architecture (as well as the "Mission style" revivalist version that became popular in the Western United States in the early 1900s) commonly incorporates verandas, both on the exterior of buildings and, in cases of buildings with courtyards, along the interior walls of courtyards. In some cases, homes were constructed with every room opening into a courtyard veranda, rather than interior corridors or direct connections to other rooms. Given its Portuguese, Dutch and British rule many colonial Sri Lankan bungalows feature Verandahs. In the Sri Lankan Walauwa (a house once used by headmen under colonial rule) it is used as a space for leisure where families will spend time or read newspapers. Given the rarity of the architectural style in contemporary Sri Lanka houses with verandahs are often featured in local films and dramas and symbolise a wealthy household. ^ Poppeliers, John C. (1983). What Style is it?. New York: John Wiley & Sons. p. 106. ISBN 0-471-14434-7. ^ "Glossary of Anglo-Indian words - Veranda". University of Chicago. Retrieved 2015-07-08. ^ Ching, Francis D.K. (1995). A Visual Dictionary of Architecture. New York: John Wiley and Sons. p. 25. ISBN 0-471-28451-3. ^ Cardinal-Pett, Clare (2015). A History of Architecture and Urbanism in the Americas. Routledge. ISBN 1317431243. Retrieved 30 September 2016. 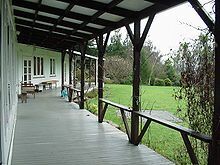 Wikimedia Commons has media related to Verandas. Wikisource has the text of the 1911 Encyclopædia Britannica article Verandah.